Сегодня ровно 200 лет Великому Сражению! The Patriotic War of 1812 began on June 24 when the Napoleonic army entered the Russian Empire. The Borodino Battle took place between the Russian army led by Mikhail Kutuzov and the French troops commanded by Napoleon Bonaparte in the village of Borodino 125 km to the west from Moscow on September 7, 1812. That’s how Russia’s Field Marshal Mikhail Kutuzov described it after engaging Napoleon’s army in a bloody battle near the village of Borodino 150 km west of Moscow. 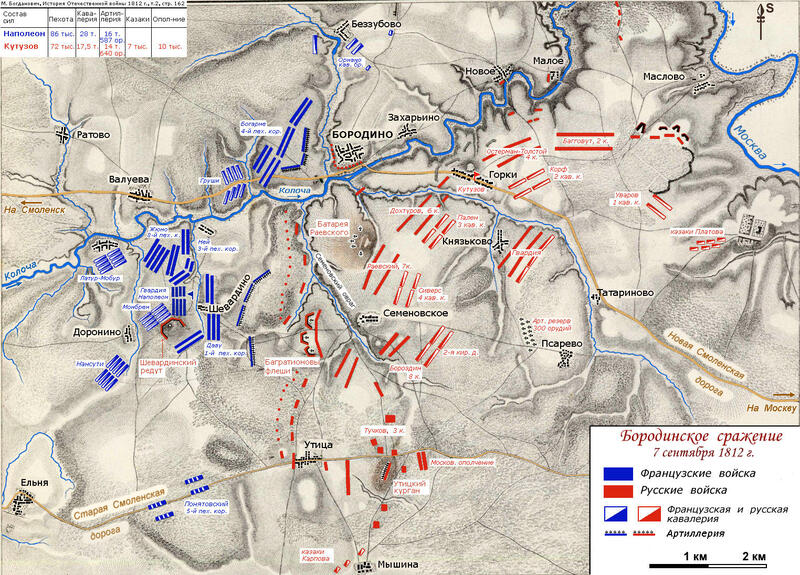 The Borodino Battle lasted for six hours and resulted in the retreat of the Russian army. The Borodino Battle death toll was extremely high with up to 8,500 people dying on both sides every hour. ; French: Bataille de la Moskova), fought on September 7, 1812, was the largest and bloodiest single-day action of the French invasion of Russia and all Napoleonic Wars, involving more than 250,000 troops and resulting in at least 70,000 casualties. The French Grande Armée under Emperor Napoleon I attacked the Imperial Russian Army of General Mikhail Kutuzov near the village of Borodino, west of the town of Mozhaysk, and eventually captured the main positions on the battlefield, but failed to destroy the Russian army despite heavy losses. About a third of Napoleon’s soldiers were killed or wounded; Russian losses were also heavy, but her casualties could be replaced since large forces of militia were already with the Russian Army and replacement depots which were close by had already been gathering and training troops. The battle itself ended with the Russian Army out of position. The state of exhaustion of the French forces and lack of information on the Russian Army’s condition led Napoleon to remain on the battlefield with his army instead of the forced pursuit that had marked other campaigns that he had conducted in the past. The entirety of Napoleon’s Imperial Guard, however, was still available to his disposition and in refusing to implement it he lost his singular chance to destroy the Russian army. The Russians consider it their victory although the Russian army had to retreat after a battle that was inconclusive in the military sense. Nevertheless, Napoleon failed to conquer Russia and was ousted from the country by late December. The battle at Borodino was a pivotal point in the campaign, as it was the last offensive action fought by Napoleon in Russia. By withdrawing, the Russian army preserved its combat strength, eventually allowing it to force Napoleon out of the country. individuals.There’s still some historical dispute about who won the battle of Borodino. On the one hand Mikhail Kutuzov ordered his army to retreat and abandon Moscow. On the other hand, this battle became the turning point in the war, and the French army was badly weakened for the first time. “Where are the POWs?” Napoleon would wonder as his army fought its way deeper into Russia. He, who had easily subdued half of Europe and had crowned himself Emperor of France, was amazed at the unprecedented degree of resistance he had little expected to encounter. More than 250,000 soldiers clashed on the Borodino field about 50 square km in area in the early morning of September 7 two centuries ago. About a thousand cannons traded crossfire almost incessantly from dawn to sunset. “There were several aspects to the Borodino battle. First and foremost, there was a huge moral aspect for the Russian army, for the people of Russia and for the Russian history. The battle ended in a draw, so to say. Neither the French won, nor the Russians backed down. Napoleon described Borodino as the greatest battle he had ever fought. And indeed, it was the bloodiest battle of the 19th century. The death toll on both sides totaled about 100,000. But though he had suffered no defeat at Borodino, Napoleon still lost the war. Why? A few months after Borodino, Napoleon’s Grande Armee was completely routed. Later, he called his invasion of Russia a “fatal mistake”. 2 Comments Posted in 1812 Patriotic War, 200 лет Великому Сражению, History Tagged 1812 Patriotic War, 1812 war history, 1812 war map, 1812 war map battles, 200 лет Великому Сражению, Bataille de la Moskowa, Battle of Borodino, Borodino 1812 map, Borodino Battle, Field Marshal Mikhail Kutuzov, French Army, French invasion of Russia, History of wars, invasion of russia, Map of the troops positions in Borodino Battle, Mikhail Kutuzov, Moscow, Napoleon, Napoleonic Wars, Patriotic War, Patriotic War of 1812 began on June 24, Russia, Russia celebrates 200th anniversary of 1812 Patriotic War, troops positions in the battle of Borodino, war 1812, What is Patrioric War?